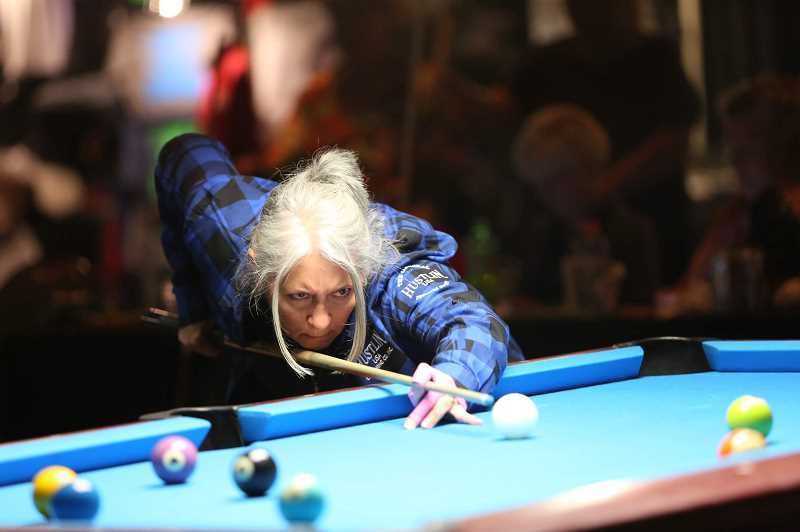 Sherwood resident Hope Elizabeth Jensen takes top spot in Vegas pool competition. Hope Elizabeth Jensen compares playing competitive pool to being immersed in a good book, or playing an intense game of chess. "It is an escape," the Sherwood resident said. "When I put everything aside and I pick up a stick and go to the pool table — your attention is on, OK, how am I going to run these balls? What is the pattern that I'm going to take? The rest of the worries of the world disappear." It's a feeling Jensen knows well, as she has been shooting pool competitively since the late 1980s. She recently reached one of the highlights of her career: Taking first place at the Las Vegas BCA World Championships 8-ball scotch doubles. Jensen was paired with Montana native Frank Kincl for the competition. She had placed in many regional amateur competitions in Utah, Idaho and the Pacific Northwest before, but had never done so well at such a large event. Jensen's husband is also an avid pool player — they met in 2000 at a pool competition in Boise — and they designed their Sherwood home to be open-concept enough to accommodate a nine-foot pool table. Between the two of them, they have five kids and four grandchildren. After turning 60 recently, Jensen decided she'd like to place in a major competition like the BCA World Championships — a "big one," as she put it. She put in some extra practice hours at the pool table to get into top competitive form. "The fact that it happened is still kind of surreal," she said. "It hasn't sunk in yet." Jensen has always been competitive — "growing up with three brothers, I had to scrap for everything" — and she has two golf holes-in-one under her belt, a testament to her excellent hand-eye coordination. Jensen calls herself a performer, and said she tends to play better in front of an audience. "When I get in the zone, all of a sudden it just has my concentration — every inch of my being has concentration," she said. "Ironically, the more people watching, the more attention I have, that is when I perform my best." Jensen and her husband are both devout Catholics, and they find a church to attend no matter where they travel for pool. Despite the stigma billiards has for being a drinkers' and smokers' game, neither of them drink or smoke. When they encounter younger pool players on the road who ask for lessons, they give them a piece of advice: "The more sober you are, the better you're going to do mentally and physically at the pool table."